Strong uptake of games and GPS position location services shows that Japan’s KDDI is mastering the art of mobile content delivery. Many in the mobile world attribute the phenomenal success of the wireless Internet in Japan to the country’s affinity for gadgets and the games citizens play. From the very beginning of wireless data services in Japan, games have been featured prominently in the service offerings of all three mobile operators. Even with limited network bandwidth and monotone handsets, Japan’s operators have always found a way to draw players to their networks. Today, all three Japanese mobile operators are offering games that feature high quality graphics, realistic sound, and multimedia action on handsets with high-resolution color displays and cutting edge synthetic audio chips. According to market researchers, Frost and Sullivan, the mobile gaming market in Japan will reach $9.4 billion a year by 2008, from about $437 million in 2001. KDDI, Japan’s second largest and fastest growing mobile phone operator, is now taking games to the next evolutionary stage with the implementation of QUALCOMM’s BREW application development and distribution platform. 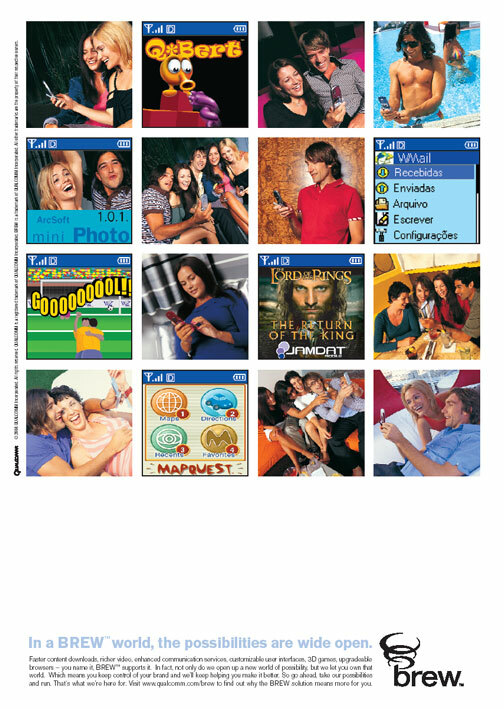 Games, above all other applications, have proven themselves to be the most popular content on KDDI’s EZweb offering. “Most of the 90 applications provided at the moment are game applications,” says Makoto Takahashi, KDDI’s vice president and general manager of the content division and content business planning department. The top five mobile applications on EZweb are Tetris Blue from G-mode, Space Invader by Taito, Xevious developed by Namco, Super Standard Golf from NEC and Cho Search from Melody Park. Of the five, the top four are games, while Cho Search is a search engine for the operator’s popular CD-quality music download service. Exploiting a combination of high speed data transmissions supported by the operator’s 3G CDMA2000 network and the technical breakthroughs provided by BREW and gpsOne, KDDI has built a successful wireless data service that combines usability with a rich feature set that includes the world’s first ever navigation service for handsets. Adding location-based information has been a key component of the carrier’s strategy. Leveraging the built-in gpsOne position location capability of CDMA chips, KDDI was the first operator to offer location-based picture messaging. With this application, users can take a photograph, for example of a shop or restaurant, attach a map indicating exactly where it is, and then forward it to a friend or partner. With position location, game developers are now able to take advantage of real world information, such as the location of the game player, to add a whole new dimension to their creations. Imagine a game with monsters that are specific to the user’s location. Or puzzles that can be solved only by referring to nearby landmarks! According to KDDI, the BREW platform offers some distinct competitive advantages – including lower power consumption, smaller application files, faster applications start time, better performance, larger handset selection and support for content authentication. That’s why they switch from Java to BREW. Essentially, BREW’s architecture of allowing applications to be run at the native code level of the hardware allows game developers to fully exploit the capabilities of the handset’s microprocessor. The additional performance improvements of BREW are also a key enabler for advanced services such as handset navigation, which require fast rendering of maps. In addition to booting up and running applications faster, BREW also takes advantage of CDMA’s innate evolution to high-speed services. While its rivals are struggling to come up with attractive and affordable handsets for their WCDMA-based 3G service platforms, KDDI has been able to migrate more than 70% of their 2G CDMA subscribers to 3G by offering feature-rich handsets that are essentially the same in size and cost. In a little more than a year, KDDI’s has signed up more than 10 million 3G users, or more than ten times the number of 3G users on the networks of its rivals, NTT DoCoMo and J-Phone. “We have the environment that allows the user to use 3G services naturally. We believe that we have the advantage to provide the advanced services as part of a natural evolution of the technology,” says Takahashi. At the same time, KDDI is taking advantage full advantage of the ability of BREW applications to cross international borders. Since BREW applications run on the same QUALCOMM chip, and receive an official stamp of compatibility through a central database run by the U.S. firm, BREW applications can effectively run on any BREW-enabled handset. This enables mobile operators such as KDDI to offer applications developed overseas. According to Takahashi, up to 20% of the BREW applications offered by KDDI originate from overseas developers and are localized for their market. The worldwide adoption of BREW also allows the developers in Japan, who are looking to expand their business, to offer their applications to not only KDDI, but to other 23 BREW carriers overseas. KDDI’s popular EZ Chaku Uta music download service is sounding more and more like a ringing cash register. Over 10 million downloads have been carried out since the launch of Chaku Uta in December 2002, according to KDDI vice president Makoto Takahashi. Today, over 2 million KDDI users have Chaku Uta-enabled handsets. EZ Chaku Uta leverages the operator’s video download platform to deliver CD-quality music in the form of MP3s to handsets. The music can then be set as a ringtone, the sound of an alarm clock or simply played back for enjoyment. KDDI has also added digital rights management (DRM) capabilities to Chaku Uta, which protects the intellectual property rights of the artists. KDDI currently has some 13.7 million subscribers to its EZweb wireless data service. Users of KDDI’s CDMA2000, gpsOne & BREW-enabled 3G service are spending an average of 2,170 yen (US$20.60) a month on data services, or 25% of total ARPU. With the debut of BREW, the face of wireless technology has been transformed. From software publishers, developers and handset manufacturers to operators and industry analysts, people are identifying opportunities and envisioning possibilities like never before. Understandably, BREW is also generating tons of buzz. In the midst of all the raves, rants and rumors, a few questions keep cropping up. Here they are, along with the answers. Is BREW really an open environment? BREW specifications are public. Those specifications include officially approved standards as well as privately designed architectures whose specifications are made public by the designers. That’s a pretty good definition of “open”. So, too, is the ability for anyone to design add-on products, which is true for BREW, too. BREW allows publishers and developers to write in whatever language they choose. C/C++ is native, but BREW also supports alternative execution environments like Java, Extensible Markup Language (XML), Flash, etc. BREW is extensible by third parties, and QUALCOMM assures that BREW stays open by making sure these extensions are published and made freely available to the publishing and development community. BREW gives publishers and developers access to operators and their customers worldwide without any intervention by QUALCOMM. Through the BREW Distribution System, operators manage their own application distribution and pricing or they can use QUALCOMM to manage their application distribution and the BREW Extranet to negotiate operator-developer pricing terms. BREW enables handset manufacturers to develop their own user interface on BREW and freely write extensions to differentiate their products. Publishers and developers from around the world can develop for and realize success with BREW. Operators in Asia, Australia, Latin America, and the U.S. have deployed commercial BREW products and services and developers everywhere are taking advantage of the openness of BREW to provide content to them all. BREW helps facilitate the import and export of applications across regions around the world via the BREW Global Publisher (BGP) program. Even publishers and developers in Europe, India and Canada have joined the global community, after recognizing that BREW is the way to go to make the most amount of money. Is BREW only for QUALCOMM CDMA chipsets and technology? Logically, QUALCOMM started with CDMA-based chipsets and technology – a huge market – but BREW is independent of the wireless technology used by any particular handset or network and can easily support other wireless technologies. The BREW platform is air-interface independent. Handsets based on other wireless technologies, such as GSM, are and will be BREW enabled, too. Is BREW open to Java developers? The media likes to portray Java and BREW as competitors in a winner-take-all slugfest. This makes for great copy, but not for great business. In fact, BREW and Java are destined to coexist – and, along the way, grow increasingly compatible. For example, QUALCOMM is collaborating with esmertec and IBM to bring all the advantages of the BREW platform to operators who want to offer a Java technology solution to their subscribers. If you're a Java developer, you can join the BREW developer community and begin making money in the worldwide consumer and business applications market that BREW is enabling right now. All content copyright © Entico Corporation 2004, unless otherwise agreed.